"A charismatic style, open-textured and inviting, this evokes peach, apple pie, honey and baking spice notes. Expansive and creamy on the palate, with balancing acidity and beautiful harmony. Fine length. Drink now through 2026. 115 cases made." "Sweet spot Outstanding. From vines planted in 1988 in Vignes Derrière. This had just been bottled and not surprisingly there were plenty of matchstick and petrol characters in evidence. Otherwise there is a somewhat finer mouth feel to the much more mineral-inflected middle weight flavors that deliver fine depth and sneaky good length. This isn't as refined as it usually is but the quality of the underlying material should ultimately make for a very fine effort." 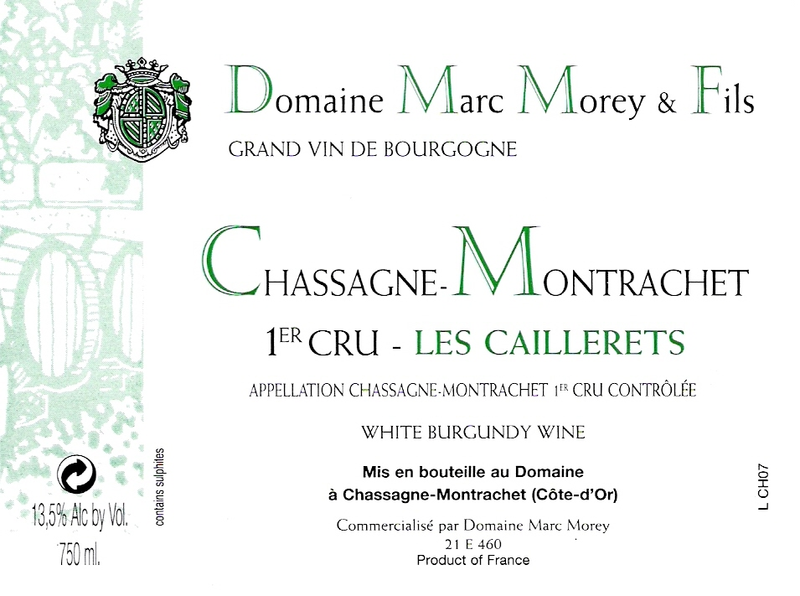 "The 2015 Chassagne Montrachet 1Er Cru les Caillerets offers the most "terroir" expression on the nose thanks to those calcareous soils imparting stoniness and mineralité. I like the precision and poise here. The palate is crisp and lively with some lovely white peach and nectarine notes, even a touch of papaya. Yes, it leans towards the tropical side of things but the energy and tension here keeps everything in balance. This could be one of the domaine's best releases in 2015." 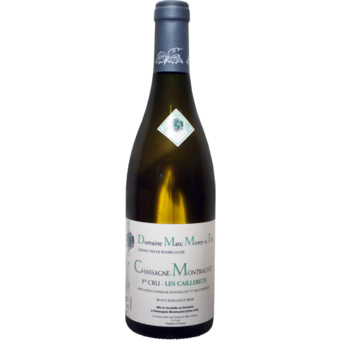 "Domaine Marc Morey was founded just after the first world war by Fernand Morey. The first vineyard holdings comprised just a couple of hectares in Chassagne-Montrachet. Marc Morey took over in 1944 following his father's death, when he quickly expanded the property. He started to bottle directly at the Domaine, and Marc Morey et Fils rapidly became a well respected name in the village. Marc's daughter Marie-Josephine and her husband Bernard joined the family business in 1977. Today, Marc's grand-daughter, Sabine Mollard, is in charge of the estate and has been the winemaker since 2003. The domaine's owns 9.5 hectares of vineyards in the Côte d'Or. Most of their vineyard sites are located in Chassagne-Montrachet. One hectare is planted to Pinot Noir and a small amount of Aligoté, while the majority of their plantings are Chardonnay. Domaine Marc Morey owns over 90% of the Premier Cru, En Virondot. Morey owns 2 hectares of En Virondot will leasing 0.1 from a nieghbor so they are the only producer for this vineyard. Sabine also owns smaller plots in the Bâtard-Montrachet Grand Cru, as well as Premier Cru vines in St. Aubin and Puligny-Montrachet. Sabine practices the principles of lutte raisonée, or sustainable viticulture in all of her vineyards and is a firm believer of the concept that the best wines must start with great grapes.